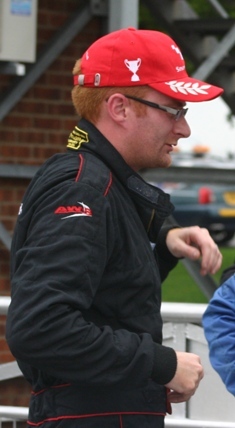 David-Hornsey.co.uk – Racer, Coach, Author. With all the myth surrounding Spa it is actually quite an easy track to drive. There are not very many corners and they are all technically fairly straight forwards. What you do need to be quick around Spa, though, is lots of bravery. 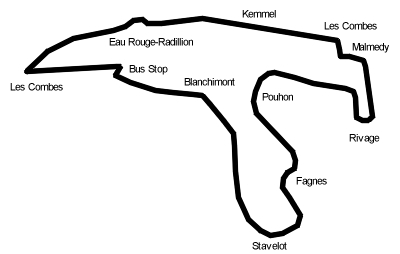 Some of the corners, Eau Rouge-Radillion, Pouhon and Blanchimont for example require a third Shredded Wheat before really attacking them. The hairpin at La Source used to be a junction on the road from Stavelot as it joined the road between Francorchamps and Malmedy. Now it is the first turn of the permanent circuit of Spa. 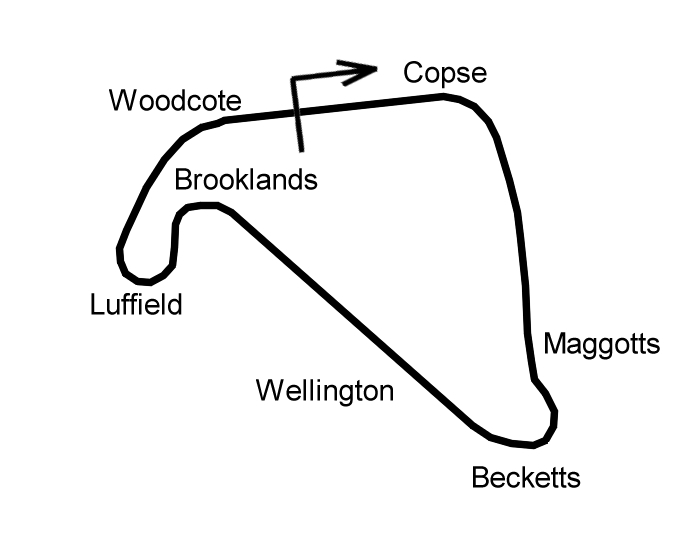 It is a fairly simple hairpin with a wide entry and exit with a steepening down hill exit. Brake in a straight line, turn in late and on the brake upto the apex, use a bit of the flat apex kerb if you want to then power on out to the exit again using the kerbs if you want as they are flat and smooth. Eau Rouge is the simple left flick at the bottom of the hill leading down past the endurance pits, the difficult part of this corner sequence is the climbing Radillion curve. Eau Rouge sticks as a romantic name however as ‘Red Water’ has all sorts of dangerous connotations. In fact it is the name of the stream that runs under the track here, so called because the mineral deposits in the water turn the rocks coppery in colour. Now I’ve shattered you illusions lets look at the corner properly. Approach down the hill slightly away from the pit wall on the right. If you get too close you will experience aero drag off the wallwhich will slow the car a touch. As you approach the bottom of the hill, move over to the right, skim the wall then bring the car over to the left aiming to use all of the kerb on the left. You want to open out the right hander as much as you can so don’t turn in too early or you will run out of road as you climb the hill. Nibble the bottom of the kerb on the right and be careful here in a powerful car as there is a slight crest at the apex which can make the car go a bit light and get you in trouble. Pick up the kerb at the top of the hill and use all of the left kerb as you exit and some of the right kerb on the Kemmel straight as well. Brake late as you approach Les Combes, the circuit is heading uphill here so you will loose speed more easily. The ‘S’ is quite quick, not like a modern chicane. Turn in just before the end of the kerb on the left and use the apex kerb on the right if you want to. It is high but smooth. Use the left apex kerb but only try to use 3/4 of the track width to the right as you exit so you can get back over to the left for a good sweep through Malmedy. It is a short straight after Malmedy but carry as much speed through and out of this corner as you can. Again use all the apex kerb and flat exit kerb. The following left hander has no name (that I’ve ever heard) and is a tricky down hill left. The car will want to oversteer as you turn in but treat it like a ‘textbook’ 90 left. Brake in a straight line, turn in a bit late, get on the power as early as you can, use all the exit kerb and maximise your exit speed for the run down to Pouhon. A tricky double apex left which is quick and blind on the way in. Turn in quite early, a good couple of car lengths before the end of the kerb on the right and aim to apex half way round the first 90 left. Let the car run out to the right in the middle of the 2 turns, using some kerb on the right here if you need to, then continue the arc with the steering as you come back into the left. Stay off both apex kerbs but again you can use the exit kerb here if you want as it is flat and smooth. the second part of the corner is all about building speed so aim to carry speed into the first part but with the slowest part at the turn in then build all the way through to the exit. Its proper name is Les Fagnes but everyone refers to it as Pif-Paf. A quick ‘S’ bend. The tightest part is the second corner, the left hander so approach the ‘S’ on the left, brake and bring the car into the right hand kerb. Don’t overdo the speed here as you need to to keep the car right of centre as you exit to get the best line through the left. You can use the right hand apex kerb but I suggest staying off the left. Exit using the flat kerb on the right. Another fairly ‘text book’ right hander but one of the slower corners on the track. You can get away with using the apex kerb here and on the exit, particularly in a well damped and powerful car, use all the exit kerb and stay on the kerb until you turn into the second part of the corner. An opening right which leads back up the hill towards the start. Its important to carry speed through here and not make any mistakes as any lost speed here will hurt you for the next mile up the hilll to the bus stop. Use the exit kerb if you need to to flatten the exit. Fast but technically quite easy. Shallow out the bend as much as you can and use the exit kerb if you need to. This is now a very severe right/left chicane. Use the flat kerbing but beware of the ‘sausage’ lumps behind the flat kerbs. Sacrifice the first corner by exiting tighter to the right to open out the left hander to give you the best run onto the start straight. The following hot lap video should be watched in conjunction with these notes. Watch the video below in conjunction with the track guide notes in the book Race and Trackday Driving Techniques, published by Veloce. Approach on the left of the circuit and brake hard. Turn in adjacent to the last marker board on the left and carry the brake into the apex remembering the ‘Scale of 10’. Apex about two thirds of the way around the corner and use the full track width ont he exit. Exit at the far side of the ‘cut-through’ that joins the Montreal hairpin to the Bentley Straight for the ‘200’ layout and use the kerb here as well. Watch the video below in conjunction with the notes in the book Race and Trackday Driving Techniques, published by Veloce. 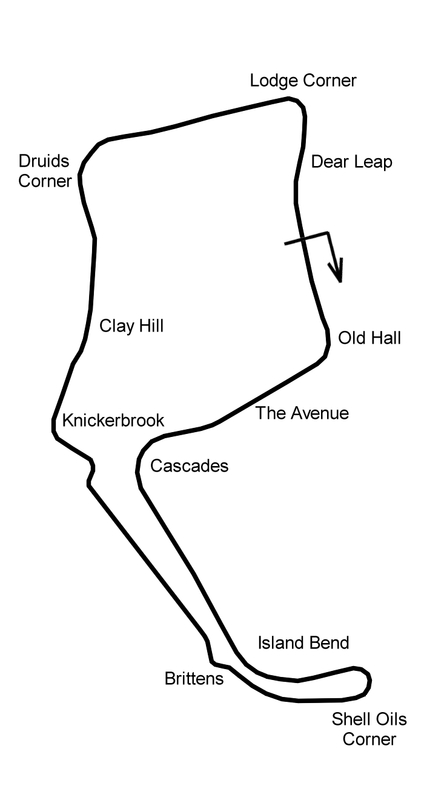 A guide to most of this circuit is available in the book Race and Trackday Driving Techniques from Veloce Publishing, however this is the small extension of the circuit between Pif-Paf and Gracelands which adds the Kirby hairpin. 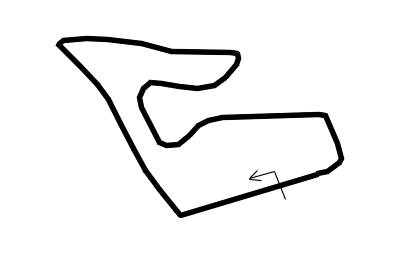 No need to turn in from the right hand side now as the left part of Pif-Paf is a much shorter corner than on the shorter version of the circuit. Pif-Paf now becomes a fast left right flick. Use as much of the flat kerbs as you can here to straighten the corners and carry as much speed as you can through. 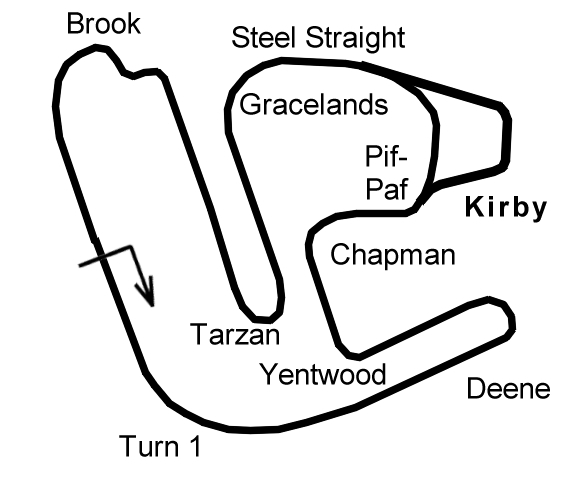 As you exit keep the car turning gently right over the brow of the hill to line you up for the braking for the Kirby hairpin. This is one of those corners which will require a differing line depending on what you are driving. The hairpin is actually two, almost 90 degree, left hand turns immediately after one another. Braking here is down hill so you will need to be a bit earlier on the brakes to compensate. In a car with more grip than power, turn in relatively early, aiming to clip the kerb on the first left hand turn. Use the brake all the way into this first clipping point, rolling off the brake all the way into the bend. Pick up the throttle and continue the curve through the second apex, using all the apex kerb and exit kerbs to shallow out the angle of the corner. In a car with more power than grip go deeper into the first turn, missing the first apex and come back on yourself after the turn to give a straighter run through the second apex hence allowing you to get the power down more smoothly. Check the video below for a hotlap around the circuit filmed from a Mazda Mk3 Cup car in testing in 2013. Other than the points below you can follow the guide in the book with the video below. Only use the extra bit of track on the left as you brake if your car is well enough damped as it is much bumpier than the regular tarmac. As of 2014 this area has been repaved so has smooth tarmac right upto the white line. Maximise the width of the track on turn in here. Depnding on your power to grip ratio it can be better to turn in earlier here and hit the ifrst apex and the second, or just the first or just the second. Generally the more grip you have relative to your power the earlier you can turn in and carry speed through to the exit. The following video was filmed in car during a race to give an idea of an ideal line. View the hot lap in conjunction with the notes here and in the book Race and Trackday Driving Techniques from Veloce.